Cheryl Hile (right) and husband Brian ran the Cape Town Marathon in South Africa in September, the first of seven races on seven continents that the MS patient aims to complete in less than 12 months. A fund manager at the University of California San Diego has embarked on an ambitious effort to become the first patient with Multiple Sclerosis (MS) to run seven marathons on seven continents in a single year. Next week, on December 11, Computer Science and Engineering department employee Cheryl Hile and husband Brian will be in Hawaii to run the Honolulu Marathon. 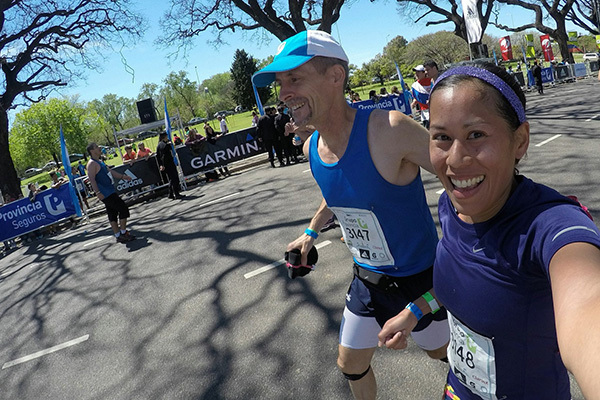 It’s their third 26.2-mile race since their running year began in September. So far Hile has raised roughly $44,000 to travel to and run in all seven races – just over 80 percent of her goal – through a crowdfunding campaign on the CrowdRise website. The fundraising appeal has undoubtedly been helped by publicity surrounding the adventure. This fall Hile was profiled by the Huffington Post, Fox News, Britain’s Daily Mail, and even the syndicated TV show, The Doctors (in an episode scheduled for Dec. 8). Locally, Hile was featured on the front page of the Dec. 1 Encinitas Advocate newspaper and the Del Mar Times online. The local angle focused on the UC San Diego runner’s decade-long collaboration with an Encinitas-based maker of orthotics, Ara Mirzaian. Completing a marathon is particularly difficult for runners with MS because the condition typically weakens the runner’s ability to pick up her foot after each stride. For non-MS sufferers it’s automatic, but with MS, Hile is prone to stumbling or falling because of foot drop. Meanwhile, she continues to raise funds to cover airfares and other costs. She says that she has raised enough to get through the race in Tokyo, Japan. That means she has just the two final legs of her record-setting run for which she needs to raise funds. She hopes to get sufficient funding well before she travels to Vienna, Austria next April, and Christchurch, New Zealand in June 2017. Assuming no major roadblocks, Hile could complete the seven-race, seven-continent record in just eight months. Read the full article in the Del Mar Times and Encinitas Advocate.